Grenada  is a group of three larger islands (Grenada, Carriacou, and Petite Martinique) and several tiny islands in the Caribbean, or West Indies. It lies just northeast of Trinidad and Tobago, and southwest of Saint Vincent and the Grenadines. It is famous for spices and is known as the "Spice Isle", being a major source of nutmeg, cloves, ginger, cinnamon, and cocoa. For a tourist introduction, try The Grenada Board of Tourism , PO Box 293, St. George’s, Grenada. Tel: 473 440-2279, fax: 473 440-6637, [email protected]. Christopher Columbus discovered Grenada in 1498. The island was already inhabited by the Carib Indians, who had migrated from the South American mainland, killing or enslaving the peaceful Arawaks who were already inhabitants there. The Amerindians called their island Camerhogue, but Columbus renamed it Concepción. However, passing Spanish sailors found its lush green hills so evocative of Andalusia that they rejected this name in favor of Granada. 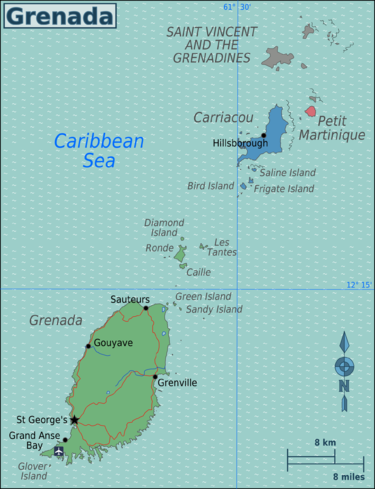 Over the centuries, although control of the island passed from France to Britain (and briefly back to France again), the name endured with just the slightest of alterations, changing from "Granada" to "La Grenade" to "Grenada". The French were the first to settle Grenada. Legend holds that in 1652 the last of the defending Caribs rather than be ruled by the French, threw themselves into the sea from a spot that was christened Le Morne des Sauteurs, and is known today as Leapers' Hill and Carib's Leap. Exploited first for indigo (hence the name of an area "True Blue"), and later for sugar production, the island prospered and, like many others in the Caribbean, attracted the attention of the British. Captured by Admiral George Rodney in 1762, near the end of the European Seven Years' War (1756-63), Grenada reverted to French rule from 1779 until 1783 when the island was restored to Britain by the Treaty of Versailles. The inhabitants' loyalties remained divided between the two European powers for many years, as illustrated by Fedon's Rebellion of 1795. In the course of this violent episode, a group of rebels under the command of the mulatto General Julien Fedon, and inspired by the rhetoric of the French Revolution wreaked havoc on the island and its British settlers in an unsuccessful attempt to reunite with France. From 1784 until its independence in 1974, Grenada remained a member of the British Empire, passing through various stages of colonial status and multiple associations with other regional states. In 1967, Grenada became an "Associated State of Great Britain" within the British Commonwealth. With this, the island nation gained control of its internal affairs, while the government of Britain continued to control external matters. Early in the twentieth century, it produced one of the region's outstanding leaders, T. Albert Marryshow. His Representative Government Association, which inspired similar movements in other Windward Islands states and in Trinidad, did much to encourage the liberalization of British rule in the Caribbean. It is ironic that the achievement in 1950 of universal adult suffrage, long a goal of Marryshow's, led directly to his displacement in Grenadian political life by a new figure, Eric Matthew Gairy. Whereas Marryshow had been a man of the middle class, Gairy and his Grenada United Labour Party (GULP) appealed to the lower class, the peasantry. Suddenly empowered by the vote, Gairy's supporters swept him to the leadership of the Legislative Council in 1951; he dominated the island's politics for almost three decades. The most successful electoral challenge to Gairy between 1951 and 1979 was posed by Herbert Blaize's Grenada National Party (GNP) in 1961, mainly on the issue of union with Trinidad and Tobago (the "unitary state" proposal). Again reflecting the Grenadian penchant for looking outward for support and viability, the GNP campaigned on a platform urging acceptance of the Trinidadian offer of union. Although Blaize's party won the election, it subsequently lost a large measure of prestige and credibility when Trinidad failed to follow through on the proposal. The GNP's fall from grace paved the way for the return of Gairy, who has never tired of the role of political savior of his country. Complete independence was achieved in 1974, with significant opposition, under the leadership of the late Sir Eric Gairy -- a charismatic and controversial figure who had been in the public eye since the early 1950s. In 1979, after a Coup d'etat, an attempt was made to set up a socialist/communist state in Grenada. Four years later, at the request of the Governor General, the United States, Jamaica, and the Eastern Caribbean States intervened militarily. Launching their now famous "rescue mission", the allied forces restored order, and in December of 1984 a general election re-established democratic government. The last 31 years have been a peaceful, democratic and fruitful back to normal existence, which has included many new building structures and vastly improved infrastructure. Average temperatures range from 24°C/ 75°F to 30°C/ 87°F, tempered by the steady and cooling trade winds. The lowest temperatures occur between January and April. The driest season is between January and May. The rainy season is from June to December, where several days out of the week may see rain at some point in the day. Generally when it rains it doesn't last for more than an hour at a time. A distant third-largest island, limited tourist facilities. A valid passport and return or onward ticket is required. Visas are not required from citizens of the USA, Canada, United Kingdom and its dependencies, British Commonwealth countries, Caribbean countries (except Cuba), Venezuela, European Union countries and their dependencies, Norway, Japan, and Israel. Commonwealth of Independent States such as Ukraine and other eastern European countries are required to purchase a tourist visa on arrival in Grenada and costs EC$ 25. Duty Free Allowances - Personal items, one quart in total wines and spirits, half-pound tobacco or 50 cigars or 200 cigarettes. No restrictions on the amount of money that can be brought in. Restricted items are fruits, vegetables, meat, soil, illegal drugs, firearms and ammunition. Maurice Bishop International Airport (IATA: GND)(ICAO: TGPY) is on the main island of Grenada, located on a peninsula in the extreme southwest corner in the Point Salines area. It is about 4 miles from the capital of St. George. Delta (New York JFK & Atlanta), jetBlue (JFK), British Airways, American Eagle, American Airlines, Monarch, Air Canada (winter season), Virgin Atlantic (UK), Liat, Caribbean Airlines, Condor (Germany - winter season), Conviasa (VE)(from Porlamar, Margarita) provide direct service to Grenada; connections can be made on Liat via Trinidad and Barbados, and also from Barbados via SVG Airlines. Many cruise ships dock in or near St. George between October and May. A large cruise ship terminal was completed in 2005, allowing up to 4 ships to be docked at once. The terminal "mall" houses numerous shops, some typical for Caribbean cruises, a few unique to the island. Private moorings for yachts are available all around the island. Osprey Lines Limited, Tel: (473) 440-8126, . Ferry service between the islands of Granada, Carriacou and Petite Martinique. Charters of various sizes and crews can be found by inquiring at hotels or the Grenada Yacht Club in St. George or the island's official tourism website: www.grenadagrenadines.com. The town centre has several hilly, narrow streets. Drivers are very careful but personal care must be taken as some streets have very narrow or no sidewalks. The town also has the most picturesque horse-shoe harbour in the Caribbean with restaurants, shops and supermarkets. Travel in and around the city St. George's is by taxis, minibuses or hired cars. Hailing a taxi is similar to other parts of the world - hold out a hand and beckon to the driver. Taxis carry an 'H' on their licence plates. The independently owned, but government licensed, cars and vans will stop and ask if one wants a ride. Some standard fares include EC$30 from the airport to St. George's and EC$25-$40 for trips from most hotels to the various dining spots around the city. Buses in Grenada are the standardized form of transportation. They are mini-vans that hold between 15-19 people, and they have route numbers and signs on them. In the centre of town (Melville Street), there is a bus terminal and in and around the town there are designated bus stops, however, once you leave town, you can signal a stop by either knocking on the side of the bus or pressing the stop button. Conductors and drivers are always very friendly, so do not hesitate to ask them where you should stop. Bus fares vary between EC$2.50-10.00 depending on the distance. They are lively trips, with great music and a nice breeze. Car rentals are available, with rates of US$50-75 per day. With a valid license from your home country you will qualify for a temporary Grenada license which can be obtained from any police station for a fee of EC$30. Drive on the left and make frequent use of the car's horn when coming around the numerous blind corners in the mountains. Water taxis are another means of getting around - between the Cruise Terminal, Grand Anse Beach and the Carenage. Standard (British) English is the official language of Grenada and is widely spoken. However an English-based Creole language (not referred to as such by locals) is the dominant tongue of most Grenadian people and can be difficult for people outside of the Caribbean region to understand. French Patois used to be the dialect language spoken within Grenada, but it only remains within the older generations and in scattered pockets. Most Grenadians only know a few words. There is so much to see in Grenada ... historic forts, lakes, waterfalls, spice estates - some of them still operational today, spice gardens, floral gardens (Grenada won its 7th Gold Medal at the Chelsea Flower Show in London in 2009), rum distilleries (with generous samples), plantation houses, Amerindian petroglyphs, etc. Note: Some of the sites noted below may be closed on Saturdays and Sundays. Check in-advance. Belmont Estate Located in St Patrick only an hour’s scenic drive from the island’s capital, St. George. Belmont Estate is a unique and authentic 17th century plantation that offers guests an opportunity to participate in and observe the workings of a fully functional historic plantation. Belmont Estate has forged a strategic alliance with The Grenada Chocolate Company , to make the world's finest dark organic chocolate. The Grenada Chocolate Company and Belmont Estate are members of the Grenada Organic Cocoa Farmers Co-operative Society Ltd., that grow organic cocoa to make the product. The co-operative consists of about twelve farmers that have received organic certification through the German certifying company Ceres. The fine restaurant on property is usually closed on weekends, and reservations are recommended on other days. Annandale Waterfall in the St. George's district. Clark's Court Distillery is in the St. George district and is famous for a wide variety of rum products. Westerhall Rum Distillery Westerhall Estate in St. David's. Visit the Museum. Take a tour of the ruins and sample their award winning rums. Dougaldston Estate is the oldest Spice Plantation in Grenada - close to Gouyave in the parish of St John. Gouyave Nutmeg Factory a "must do" in Grenada the "spice island". Carib's Leap a historic place in the north of the island where the last Carib Indians jumped from a high cliff. Morne Rouge Bay one of the most beautiful beaches in Grenada - secluded and close to the Grand Anse area. Marketplace nice Caribbean market with newly renovated spice market hall in St. George's - great for spices and fresh fruits & vegetables. Bay Gardens a tropical Garden with a rain forest style - located in the St. Paul`s area of St George's. '"St. George's University'" The School of Medicine opened in 1976 and now offers a range of graduate programs. The True Blue campus features breathtaking panoramic views of the south of island and is ideal for sunset viewing. Gouyave Fish Friday. Gouyave is regarded as the town that never sleeps. It is a great evening out with a nice drive to this West Coast fishing village. Don't be afraid to venture out. It is perfectly safe and frequented by tourists and international students from the Medical School. The food is fresh, inexpensive, and prepared before your eyes. There is festive music, lots of kids milling about, and the night ends in a party at various night clubs. One can have a great meal and a couple of beers for less than $10 US. Lobster, shrimp, and fresh fish, right out of the water is prepared in various forms. Dress casual with comfortable waking shoes and check out all the stalls and offerings before deciding on what to eat. It is actually possible to take a bus to Gouyave from the tourist areas for about $2 US, but if you plan to hang late, there is no guarantee of getting back to town after 8 pm. So taxi or "on demand" vehicle may be your best bet. Some hotels and ground tour operators also offer tours that will take you to/and from Fish Friday. Gouyave is full of "characters' who would do no more than entertain you. No need to be alarmed if they are overly friendly. You are not likely to be accosted by hustlers as the locals are very protective of guests who patronize their showpiece event. Diving & Snorkeling. The island has an abundance of marine sites (both Grenada & Carriacou) and the first Underwater Sculpture Park in the world. The island is known as the Diving Capital of the Eastern Caribbean. It has the largest shipwreck in the Caribbean - the Bianca C - a 600ft cruise ship which sunk in 1961, now lying in 167 feet of water. There are more than 50 sites, including reefs, wrecks and walls most within 5-15 minutes boat ride from the dive shops. River Tubing; Hiking; Mountain Biking; Sporting and family activities. Get Married! Weddings are legal and you only need to be on island for 3 days (including weekends); beautiful and unusual wedding sites (beaches, waterfalls, forts. Hashing a different trail is set each week anywhere around the island for walkers and runners. A great way to see the beauty of Grenada and meet locals and visitors. http://www.facebook.com/groups/grenadahash/ or http://grenadahash.com/home Be aware of the island's steep slopes, heavy jungle and roads without shoulders; each can present a unique risk. Sailing Must go on a day sail charter. Quite a few charter companies available. http://catamaranchartering.com/sale.htm Also do the dingy tours by renting your own dingy and going for a spin with Sea Fun Adventure at Port Louis Marina. Grenada produces many amazing products. Rum, Chocolate, Honey, Jams and Jellies, Spices, Clothing and Art. Many are award winning. Support the local economy when on the island and buy local goodies to bring back home. To bring herbs/spices back to the U.S. (and several other countries), they need to be within properly sealed containers. Most responsible sellers offer them packaged - check to be sure. Real vanilla is a steal in the markets, sometimes it can be found for as little as $1US for a 1/2 litre bottle. The concentration of the fluid does vary, but in its pure form there is a noticeable (and very pleasant) difference from the vanilla extract that most North Americans are used to. You might also look for dried vanilla beans (in pod)...an essential to a full range of kitchen herbs/spices. Locally grown and produced chocolate is gaining a good reputation. You can find excellent bars of varying cocoa percentage at the cooperative store, nearby Belmont Plantation, grocers, and the cruise terminal. Rum Grenada makes some of the best Rum. You will understand what 'good' rum is when you try Rum made in Grenada, and may even become a convert when you 'sip a good rum'! Grenada Chocolate one of the best in the world. Dark, organic chocolate. Look for it's beautiful, brightly colored packaging. The large cruise ship pier outside the main harbor offers a small, enclosed, "duty-free" mall. It has several shops (and food outlets) offering both local items and those typically for cruise passengers. Prices on local products may be at a premium to stores elsewhere on the island. Just a block away, you'll find the spice market with stalls run by families and growers. Aquarium Restaurant & Bar  located at Point Salines and is famous for its Sunday BBQ - great location on the beach. Beach House Restaurant & Bar is located at Point Salines. The Red Crab in Lance Aux Epines on the main road and has a fabulous menu. Le Papillion Cafe in Grand Anse at the Siesta Hotel. Breakfast all day, lunch, great fresh food and service. Start your day off here. De La Grenade  manufacturer of nutmeg products including liqueur, syrup, pepper sauce, jams and jellies. Grenada Chocolate Factory  produces organic dark chocolate with vintage machinery run by solar power. You should be able to find the colorfully packaged bars in stores throughout the island and at the duty-free shop at the airport. Tours of the factory itself are also very interesting. Umbrellas Beach Bar on Grand Anse Beach. A famous 'liming spot' on the island, known for its Amazing homemade burgers and fresh food, cold drinks and great prices. Upper and lower deck, so casual, you can walk up from the beach with your sandy feet. Be prepared to be there often! Grenada is known for its rum distilleries. The three largest companies are Clarke's Court, Westerhall Estate and River Antoine. All three offer educational tours that demonstrate the sugar production for rum. They are all located on different parts of the island. Westerhall Estate make a family of award winning rums including a 3, 8 and 10 Year Old Rum. Their special rum (with the wax casing) Westerhall Plantation and Westerhall Vintage, are probably the best rum on the island. In addition to their overproof Jack Iron and White Jack Rum. Their new 12 Degrees Premium Rum is delish! Clarke's Court makes both light and special dark rums which are also quite delicious. Be forewarned about River Antoine. It's 75% alcohol content makes it illegal to take home to many countries, at least on flights. They make a version with 69% intended for "exporting" that may be legal. At all the distilleries you can buy at least small bottles, and you'll find normal sizes in most grocery stores and rum shops. Pirate's Cove Restaurant and Jolly Roger Sports Bar"
Grand View Inn, Grand Anse - phone "473.444.2342/4984"  Open for "B- 7-10, L- 11-2, D- 7-9, offering local fare at modest prices, to include banquets, catering, and parties. Excellent view of the island. See each island's article for accommodation listings. Grenada (island) offers a variety of accommodations, from small guesthouses to five star, all-inclusive resorts. Carriacou though smaller, has many options. Petit Martinique although much less developed has a few options. Grenada is a fairly safe country. However, the high humidity and glaring sun in the summer means you should drink plenty of water. Take bottled water on outings. There may be more danger for pedestrians on the narrow sidewalks and streets than from crime. Jan2019: Be aware of boat/yacht customs entrance fee scams BY THE LOCAL OFFICIALS!!! Before paying and handing in the money, mention that you will need a receipt for all payments IN THE CURRENCY YOU PAID, PARTICULARLY IF THE OFFICER IS ALONE in the office. This issue has been observed at the customs/immigration office located (but not affiliated with) Le Phare Bleu Marina, but this may take place at other entrance points as well. There is a General Hospital in St.George's, a smaller hospital at Mirabeau on the east coast and one in Carriacou. A small private hospital in St. Paul, clinics and doctors are available. House-calls can be made. Drinking water is chlorinated in most places; if in doubt about safety/potabiliy, ask the seller or server. Dialysis is now available on the island. A company called Island Health Services has opened the first dialysis unit. Fresenius has been operating for almost a year now. If regularly dependent on dialysis, ensure in-advance that the type(s) offered meet your needs. Have fun, but use a condom! Local slogan - "Don't be a fool, wrap your tool!" Although Grenada is a West Indian island in the Caribbean, Grenadians do not spend the majority of their time "liming" on the beach. They are very serious about their jobs and many workplaces require specially-tailored suits. Though work remains, they rightly take well-deserved pride in widespread repairs to massive damage from hurricane Ivan. St. George's Town is a place of commerce with the many banks, businesses, and governmental offices. Do not confuse it for the beach. It is often seen as rude or disrespectful for people to walk around Grenada inappropriately dressed, especially if you are dressed for the beach and you are not on it (Grenada just recently passed and is starting to enforce an indecent exposure law that bans bathing suits in non-beach areas as well as saggy pants that reveal underwear). Do not confuse the laid-back attitude for lazy, as Grenadians have a very formal and conservative attitude about their lifestyle and workplace.